Over the past few weeks it was discovered that the new film from director Makoto Shinkai will be screened at a number of theaters throughout the United Kingdom. No one knew who it was that was offering this but today some special news has appeared. Makoto Shinkai’s newest film Your Name., also known as Kimi no Na wa., has been approved by the British Film Institute to take part in the film festival’s 60th competition in London. This will be the first Japanese animated film ever to take part in this competition. In addition the distributor Anime Limited have acquired the theatrical rights to the film, and was responsible for providing the cinema screenings across the country. The film will be screened across numerous cinemas nationwide on 24th November, making the UK one of the first countries outside Japan to release the film in theaters. We’ll have the full list of cinemas screening the film below. The tickets for all three cinema screenings will be made available on 15th September at 10am via the BFI London’s official website. small mountain town, but longs for the bright lights of Tokyo far away. 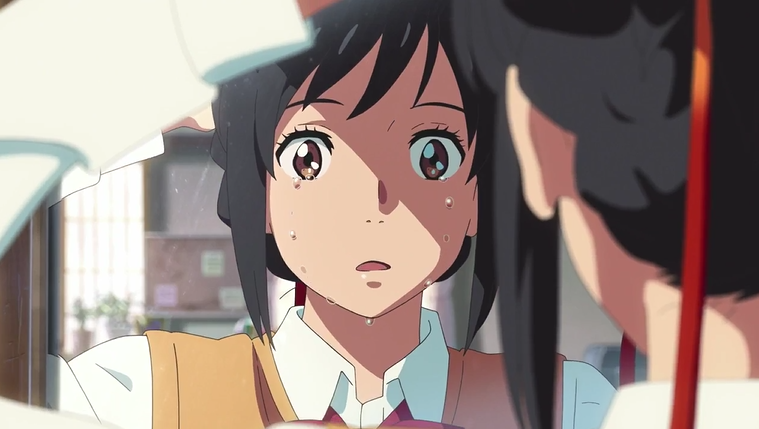 Then she is astonished to wake one morning in the body of Taki, a teenage Tokyo schoolboy – who in turn wakes up in Mitsuha’s body! Your Name. was first screened at Anime Expo 2016 in North America back in July followed by Japan’s first theatrical release in August. Your Name. has also topped the Japanese box office charts, earning 1,277,960,000 Yen (about £932,000) in three days since opening plus selling over 688,000 tickets. The film’s original novel has also topped the sales as well as the original soundtrack from Japanese rock band RADWIMPS on the Oricon weekly album chart. Staff and cast for the film also includes Animation Director Masashi Ando (Spirited Away, When Marnie Was There), Character Designer Masayoshi Tanaka (The Anthem of the Heart), Actor Ryonosuke Kamiki (Summer Wars) voicing the main male character Taki, and Actress Mone Kamishiraishi (live-action Chihayafuru films) voicing the main female character Mitsuha Miyamizu. Makoto Shinkai is known for his directorial works on Voices of a Distant Star, The Place Promised in Our Early Days, 5 Centimeters per Second, Children Who Chase Lost Voices (released in the UK as Journey to Agartha) and The Garden of Words in addition to a number of short films including She and Her Cat and Cross Road. The director was also involved with the popular ef ~ A Fairy Tale of the Two franchise. Anime Limited will soon be releasing the director’s first two films (Voices of a Distant Star and The Place Promised in Our Early Days) on Blu-ray later this year, and have already released his previous instalment The Garden of Words on Blu-ray also. Manga Entertainment have released 5 Centimeters per Second on DVD and Kaze UK have released Journey to Agartha on Blu-ray. Anime Limited issues an update on the long-awaited replacement disc scheme for their megahit film “Your Name”. Makoto Shinkai’s world-famous anime film your name. will finally receive its home video release in Japan on July 26, and it may be of interest to UK anime fans that these releases (4K Ultra HD Blu-ray, Blu-ray and DVD) will include English subtitles and are region-free.